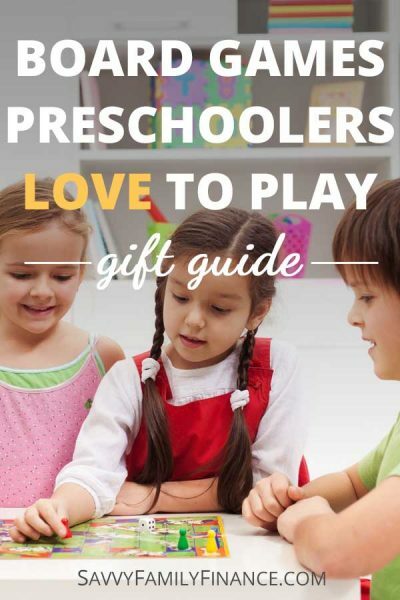 Inside: Looking at board games for your preschooler? Here is a list of great games that will keep the kids and family entertained. We are a family of gamers. Our collection was a fairly good size before we had kids and has grown since then. Of course, one reason we introduced games to our children early was because we enjoy playing. We also know that games are a great way to introduce skill-building. Kids learn to cooperate, take turns, identify colors, learn shapes, count, learn matching, and work on dexterity. With a bit of practice, kids also learn to exhibit good sportsmanship. When we look at games to bring into the house, we look at how well the game is built and how crazy it will make us. I mean, let’s be honest. There are some games that you tire of after playing once or twice and doing any more with your preschooler makes you want to pull your hair out. These games, however, have been tried by our family or many others as ones that the family enjoys playing over and over and over and … You get the picture. I wish we had this when the kids were little! Here, children ages 3+ work as a team to find hidden objects and solve mysteries. There is a long game board that you set up. A spinner will tell you what moves to make on your turn. To win, all players must be on the ferry and cross to Picnic Island before the pigs eat all the food. Kids love acting out characters in this game from the makers of Silly Street. The whole family has a chance to sing, mime, and act their way around the game board. Each player gets a playbill with a list of items. You select items from your playbill to perform and others have to guess. If other players guess correctly, you get a ticket. The first player with tickets for all items on their playbill wins. Wig Out! is a fast-paced game the kids enjoy. It lists recommended ages of 6+ but, in my opinion, many children could start playing this around age 4. The graphics are fun and silly and kids learn to pay attention to the cards on the table. To win a round, a person must get rid of all of her cards. There are 5 rounds to each game, and the person that wins the most rounds wins the game. This was one of the first games our children played. For ages 3+, children practice taking turns in this award-winning cooperative game where snails race to the finish. This fun game for the younger set is one the kids will enjoy. There are six animals on each card. Each card has a match with another card and the goal is to be the first to spot and name the match. Spot It Junior Animals has variations to make it more challenging, cooperative or competitive. Older kids may enjoy the regular version of Spot It. When the kids started grade school, they and their classmates loved playing Boggle. Here, Boggle Junior is fun for the preschool set. It uses pictures and matching games with two different skill levels. Work on shapes and colors with this fun, non-competitive matching game. Players roll a color and shape die, find the correct piece, and place it on the game board. There are four different levels to challenge players of varying age. In this cooperative memory game, kids try to match flowers and collect cherries before the bird gets to the tree. The game play time is short, perhaps 10-15 minutes, which is perfect for young children. This is a fun color matching game for preschoolers. Players shake the panda dice, then try to match their panda cards to the the dice colors to get a reward tile. The player with the most reward tiles wins! This is an award winning game by Peaceable Kingdom. Players help the all the owls get to the nest before the sun comes up. There are two levels of play to help engage kids of different ages. Preschooler board games generally have a shorter play time to allow for shorter attention spans. They are also great to pull out when you want a bit of together time with your child. What are your favorite games for 3-5 year olds?